Historians call the family Sharabhapuriyas, because the majority of the dynasty’s inscription were issued from the Sharabhapura. D. C. Sircar theorised that the dynasty was known as Amararyakula. Most of the dynasty's grants have been found in and around Malhar and Raipur, in Dakshin Kosala. These inscriptions were issued from Shrabhapura and Shripura. The identification of Sharabhapura is not certain, while Shripura has been identified with modern Sirpur. Some scholars have identified Sharabhapura with places in present-day Andhra Pradesh and Odisha, but these places are located far away from the find spots of the inscriptions; it is more likely that Sharabhapura was located in or around the present-day Raipur district. KD Bajpai and SK Pandey identified Sharabhapura with Malhar, but A. M. Shastri points out that the excavations at Malhar reveal that the establishment of the town can be dated to c. 1000 BCE or earlier. Therefore, it cannot be identified as a city established by Sharabha who ruled nearly 1500 years later. Moreover, there is no evidence that Malhar was called Sharabhapura: its earliest known name is Mallala or Mallala-pattana. Hira Lal once theorised that the Sharabhapura was another name for Shripura, but this theory is now discredited. Sharabhapura appears to have been the original capital of the dynasty. A. M. Shastri theorises that Sudevaraja established Shripura and made the town his second capital. his successor Pravararaja moved the kingdom’s capital to Shripura. Sharabha is the earliest known king. He is known from two inscriptions of his son Narendra. The name suggests that he established the city of Sharabhapura (and probably the dynasty). Maharaja Narendra, the son of Sharabha, issued the earliest extant grant of the dynasty. Three grants made by him have been found. Prasannamatra is the next, No inscriptions or grants by him are known. However we find a number of coins with him name and also known from the seals of his son Jayaraja and grandson Sudevaraja. His relationship with Narendra is not certain: he may have been Narendra's son or his descendant. Prasanna had two sons: Jayaraja and Manamatra (the successor of Jayaraja). Jayaraja was a son of Prasnna.He was the first ruler of the dynasty to add the prefix Mahat to his name, a practice followed not only by his descendants but also by the kings of the later dynasties such as the Panduvanshis and the Somavanshis. Sudevaraja was a son of Manamatra. He seems to have established Shripura, where the earliest inscriptions were issued during his reign. Pravararaja was another son of Manamatra.He appears to have moved the kingdom’s capital from Sharabhapura to Shripura. No successors of Pravararaja are known with certainty. An inscription of one Vyaghraraja has been discovered at Malhar. This inscription was issued from a town called Prasanna-pura, and describes Vyaghraraja as the son of Pravara-bhattaraka. D. C. Sircar and some others theorised that Vyaghraraja was a Sharabhapuriya king. Prasannapura may have been named after his ancestor Prasanna. The inscription also mentions one Jaya-bhattaraka, who has been identified with Jayaraja. Ajaya Mitra Shastri has contested this theory on several grounds. Vyaghraraja's inscription features 'nail-headed' characters unlike the box-headed characters of the Sharabhapuriya inscriptions. Its seal, its textual style and its grant order are also different from those of the Sharabhapuriya inscriptions. Panduvamsis of Mekala preceded Sharabhapuriyas. Panduvamsis of South Kosala succeeded Sharabhapuriyas. Udayana was the first king of this dynasty. He was succeeded by Indrabala. Nanna I succeeded him and he in turn was succeeded by Mahasiva Tivaradeva. He was the most successful king of this dynasty. He extended his kingdom to Utkala, Kosala and other nearby states. He was succeeded by his son Mahanannaraja or Nanna II. His uncle, Chandragupta (of Later Guptas), succeeded him. His son, Harshagupta, was married to Vasata, the daughter of Maukhari king Suryavarman of Magadha. Harshagupta son from Vasata, Mahasivagupta alias Balarjuna, ascended the throne after Harshagupta. Mahasivagupta was a powerful king and enjoyed a very long rule and he was followed by Sivanandin. D. C. Sircar theorised that the dynasty was known as Amararyakula, based on inscription of Vyaghraraja. However, A. M. Shastri has opposed this theory, arguing that Vyaghraraja was not associated with the Sharabhapuriya dynasty. 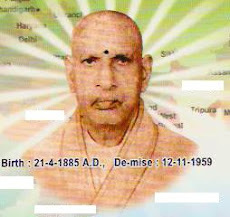 In Dhamatari and Kauvatal grants, Sudevaraja mentions certain Indrabala raja as occupying the office of Sarvadhikaradhikrata or Chief Minister. Can Indrabalaraja be the same as Indrabala of Panduvamsis. This is looks very tempting as the Panduvamsis succeeded Sarbhapuriyas and they could have been employed by them and later they could have succeeded. However this theory falls flat as the Kharod inscription mentions Indrabala as reigning monarch. He also founded a city of Indrapura. However we can say that he was subordinate and later ruled as independent ruler. The Allahabad pillar inscription of the Gupta king Samudragupta states that he defeated one Mahendra, who was the ruler of Kosala. One theory identifies this Mahendra as a Sharabhapuriya ruler. However, there is no evidence in support of this theory. A 510 CE Bhanugupta Eran inscription mentions one Sharabharaja as the maternal grandfather of one Goparaja, who died in a battle. Based on the identification of this Sharabharaja with the Sharabhapuriya king Sharabha, we can fix date of the king. The Kurud inscription of Narendra records the renewal of a grant that was originally made by a Parama-bhattaraka ("Supreme Overlord") to a Brahmin. The original grant was recorded on palm leaves, which were destroyed in a house fire. A. M. Shastri identifies the Parama-bhattaraka with a Gupta emperor (the Gupta capital Pataliputra was located on the banks of the Ganga river). He theorises that Narendra's Sharabha began his career as a Gupta vassal. But we have no evidence of Gupta monarchs in the inscription or elsewhere during that time. We do not know who this paramo-bhattaraka is. In Bamhani grant, Surabala makes reference to Narendra, B.Ch.Chhabhra says that Narendra refers to Narendrasena of Vakataka dynasty. Narendrasena father refers to his extensive territories as Kosala, Mekala and Malava. So this is supposed to acknowledge the overlordship of Vakatakas. D. C. Sircar theorised that the dynasty was known as Amararyakula, based on the Malhar inscription of a ruler called Vyaghraraja. However, A. M. Shastri has opposed this theory, arguing that Vyaghraraja was not associated with the Sharabhapuriya dynasty. There is a mention of Amrarayakula in Mallar and Bamhani Plates of Surabala of Panduvamsis from which princess Lokaprakasa was born. Lokaprakasa, queen of Bharatbala. is from south Kosala and we cannot put her in other dynasty during this period. So we can say Sharabhapuriyas are from Amararajakula or Amararayakula, both means same. Bamhani and Mallar plates says Lokaprakasa was from Amaraja Kula. When we consider the Vyaghyaraja plates, it is clear that Sharabhapurias belong to Amararayakula. In Sanskrit, there are two related words "Bhata" and "Bhatta" generally meaning a soldier and a scholar respectively. Occasionally they are used interchangeably. A "Bhattara" or a "Bhattaraka" is the chief of them. Thus a "Bhattaraka" is either a regional ruler (mandalika) or a regional chief of an order of monks (i.e. an Acharya). A “ parama- Bhattaraka" is then either a overlord sovereign, or the Chief of all Acharyas. The Maitraka dynasty of Valabhi was founded by “Bhatarka, a General. Dikshit said that the Bhattarka mentioned here in Kurud inscription is Father of Narendra that is Sharabha. But Sircar point out that Father is missing in the inscription. Later ruler from the same dynasty Jayaraja takes the title Jaya bhattaraka, so we do doubts supporting this. Another scholar has pointed out that Parama Bhattarka with Maharajadhiraja has been to refer to Guptas. And the references to Bathing in Ganga should mean it refers to Guptas of Pataliputra. One has to see here that the Ruler omits name of the Parama Bhattarka- pada. Narendra does not include Gupta Era and does not take feudatory title like paramo bhattaraka padanudhayata Here. Vyaghraraja inscription issued describes Vyaghraraja as the son of Pravara-bhattaraka. The inscription also mentions one Jaya-bhattaraka, who has been identified with Jayaraja. So can we say Bhattarka refers to some ancestor of Narendra. There is panduvamsis of Mekala also took titles Parama Maheswara, Parama Brahmanya and Parama guru devatadhidaivatavishesha. Panduvanshi of Kosala also refer themselves with parama Bhattaraka titles. We can say parama bhattaraka is title refers to one of Mekala Panduvamsis. As far as Gupta Overlords are concerned there seems to be none, just the Indologists invention. The Bamhani inscription says Narendra in the end of sentence. If Vakataka Narendrasena was the overlord, then there is no way they can addressed like that. On careful examination we see that the Narendra coming at the end of stanza refers to Surabala himself as king. As far as Vakataka overlords we see none. All the inscriptions are in nail-headed characters not Box Headed characters of Vakataka. So We can safely say there is no vakataka in Mekala at that time. We cannot find any evidence around South Kosala for Surya or Bhimasena during Sharabhapuriya dynasty, We have no evidence of any overthrew of this dynasty. This dynasty has to be dated with Guptas and they belong to different time. We have seen that there is not much dispute on the order of kings, but there is a confusion on period of kings. Let us see. A. M. Shastri estimates the reigns of the Sharabhapuriya rulers as follows: based on Sharabha's identification with the Sharabharaja mentioned in the 510 CE Eran inscription, he assigns Sharabha's reign to 475–500 CE (assuming a 25-year reign). Similarly, he assigns 25 years to the next two kings. Since Jayaraja's latest inscription is dated to 9th regnal year, Shastri assumes a 10-year reign for Jayaraja, and some subsequent kings. Indrabala of Panduvamshi ended Paravaraja rule. If we take the Trivaradeva rule, which is 550AD, we can arrive ending of Sharabhrapuria rule in the capital Sharbhapura around 530 AD. Eran Inscription (510AD) of Bhanugupta contemporary Goparaja says his maternal grandfather was Sharbharaja, If we take the sharbharaja as founder of the dynasty. Which will put him at 460 AD. Bhanugupta is mentioned as Governor, and we do not have any info on Guptas here. The inscription talks about battle with Maitrakas in which Bhanugupta died and his wife followed him to the funeral pyre. We do not know sarbharaja mentioned here is Sharabha of Sharbhapuria, but it is assumed as such and dating is worked to 460 AD, considering that his son Narendra ruled for 25 years. Sharabharaja mentioned in the inscription is meant to Sharabharaja and Contemporary king of Goparaja has to be taken as Prasannamatra, One of the reason can be taken as Eran has the best mint for gold coins in India. Eran mint gold coin influence can be seen in prasannamatra gold coins. Lokaprakasa is daughter of Sharabharaja. Parama Bhattaraka Pada refers to Panduvamsis of Mekala. And Narendra when making this inscription is feudatory of Panduvamsis of Mekala. After Surabala panduvamsis of Mekala power weakened and we have Sharabhapuriyas under Narendra taking over as the overlords of Panduvamsis of Mekala. Jayaraja was succeeded by manamatra, who had very short tenure followed by his two sons sudevaraja and parvaraja. After parvaraja death and resulting confusion, Indrabala the chiefminister from Panduvamsis clan has taken over Sharabhapura. A last ditch effort seems to be from Vyagyaraja son of Parvaraja In sripur. This taking over took place around 530-535 AD, and panduvamsis of Kosala have risen. Inscription seems to use a borrowed south Indian scribe and who seems to have no much idea of official grants of Sharabhapuriyas. Geneology can be from Eran Inscription. Sharabharaja (440 - 460AD), Narendra (460-485AD), Prasannamatra (485 to 510Ad), Jayaraja (510 - 520AD), Manamatra (Unknown), Sudevaraja (520 - 530AD), Parvaraja (530-534AD). Geneology years of Mekala Panduvamshis cannot be constructed because of paucity of records. Guptas and Vakatakas are not overlords of Sharabhapuriyas or Panduvamsis, they belonged to different era. Until 4th century AD. This era was called Krta era. Around 8th century AD. we have Vikramaditya associated with this era. Some Schoalrs like D C Sircar says it is corruption of the term Kirta, which means purchased. Altekar says Vikramaditya was the king who founded the era and Krta indicated some kind of leader. Bhandarkar says that the era was actually Krtayuga or Golden Age. He says it was talking about Pushyamitra reign. Bhattacharya says it starts the settlement of Malwa. Why does not the inscriptions say it is Krtayuga is not explained by these theorists. Malwa got name from people Malavas who inhabited this place. In Sanskrit Malav indicates Lakshmi. 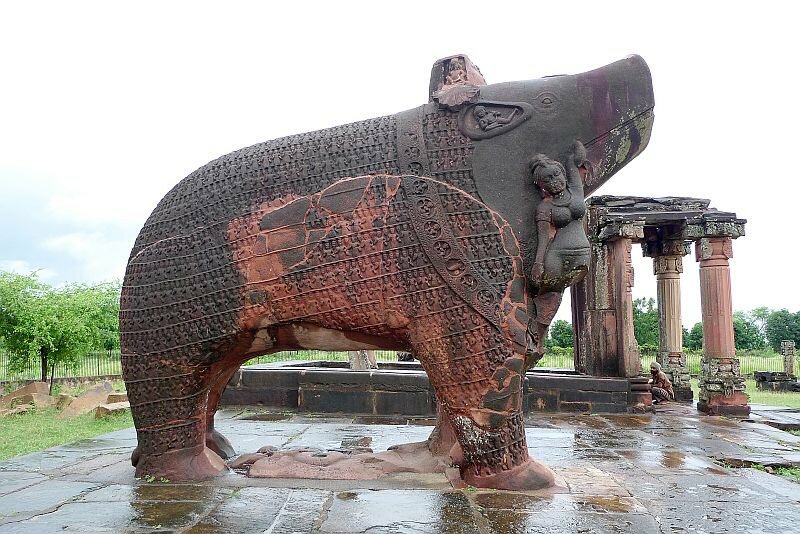 Malwa was a Mahajanapada (Republic) from 730 BC. Ancient Malwa was called Malloi by Alexander and Greek Historians. The Malwa region with Ujjain as capital had Vikramaditya ruling with navaratnas as ministers and scholars. Now malwa gana represents these groups of eminent scholars.. So Malwa gana era indicates the era of these people. In the Inscriptions from 4th century AD to 8th century AD, it is referred to as Malava Gana, though Krta is also used sometimes. Around 6th century it is called for the fame of Malwa vamsa. We have coins malavaganasya jayah, Malavanam jayah , Jayah Malavanam indicating the victory of Malwa people apparently over Sakas. Malwa Gana Saka show that it was era of malwa people. Around 9th century it is called vikramaditya Kala. After 11th century the era is fixed to Vikramditya and is so called vikrama Samvat or Vikrama Kala. Aryavidya (by sudhakar) says that Mahavira attained his Nirvana 470 years before king Vikramaditya. Pattavali says that Vikramaditya was born 470 years after Mahavira Nirvana. So Mahavira Nirvana happened 527 BC. Kalpa Sutra says Mahavira lived for 72 years. So Mahavira lived between 599BC and 527BC. There was a Jain king Vairisimha of Dhara (Dhar, MP) and Queen Surasundari, who had a son called Kalaka and daughter Sarasvati. Once when they were in Ujjain, King Gardabhilla of Ujjain was enamoured by the beauty of Sarasvati, carried her off. After futile attempts to recover her from clutches of Gardabhilla, Kalaka went westward after crossing river Sindhu reached the country where number of saka chiefs, who were sahi (Subordinates of sahanusahi) ruled. Kalaka broght them under his influence. Once their overlord became angry over Sahis, Kalaka migrated them to India. They came to Ujjain conquering along the way. Sakas defeated captured Gardabhilla alive. They established their ruler in Ujjain and divided the country among themselves. Kalaka recovered Sarasvati and avenged humiliation. After four years of saka rule, Gardabhilla son Vikramaditya drove away sakas and established his rule. Gardabhilla ruled for 13 years, Saka 4 years and Vikramaditya 60 years. This account is from Pattavali (Sanskrit) of Merutunga (14th century AD) sourced from earlier Prakrit Gathas. D C Sarkar, says that Vikrama era is continuation of Era calculated from Parthian ruler Vonones. Vonones is the earliest parthian king of Eastern Persia is have assumed title king of Kings and flourished after the Parthian Emperor Mithradates II (125 -88BC) and ruled eastern parts of his domains and Afghanistan through Viceroys Spalirises, Azes. Experts First deduced the parthian Reign of Vonones as between 120-70BC. Now Vonones is parthian name, but his brother and viceroy has saka name, Spalahora. Mithradates II has assumed the title king of kings during this time. So if take that into account. Vonones has to be after 91BC (Gotarzes challenged Mitradates). But considering his Viceroys starting at 90BC. He has to be before that. Is Mithradates = Vonanes. Now there are maues dated to 80-90BC. Vonones is a question for another Article. Now we can say Vonanes is not initiator of Vikrama Samavat. John Marshall suggest that the Vikarma Era is actually continuation of Azez Era. The Era calculated from regnal years of Saka king who ruled Northwestern Part of the Sub continent. The Era is spelled as Aya, Aja identified as Azez I. This view is supported by B N Mukherjee who cites number of inscriptions of Maharaja Aya, Itravarman. The inscriptions refers to Atida, Varta Kala which indicate Expired Years. Now Krta refers to present time. So Atita and Vratta refers to past and this betrays the logic of saying Vikrama era is continuation of Azez Era. John Marshall says that the era denotes the start of Azez Aya, Aja) Era which are found in coins. Now we know that there are two Azes: Azez I and Azez II. And Azes can also be dated to 90BC from various theories floating around Mithradates, Vonanes and his brother Spalirises. Indologists have also tried to make Azes II as founder of Azes Era. Azes II can be dated to 22AD as well. There is theory that Aya, Aja cannot be equated with Azez era and there is no azez era as such other than in the minds of Indologists. Narain argued that aya refers not a king, but is appellation to month or other minor variation to some dating calender. So scholars Konow 84 BC, Narain 88 BC, Lohuizen 129 BC have proposed this to other eras. Unlike Vikrama era which can be anchored to Kali Yuga date. There is no anchor for Azez Era. Azez Era can be anchored to Greek era with Vijayamitra inscription Azez + 128 = Greek Era. But Greek Era is itself has to be anchored. Vijayamitra of Apraca gives the 27th year of his reign as 73rd year of Azes, 201 year of Yona or greek era . So the date of Azez 128 years after Indo-Greek Era. Now Studying Demetrius I (186-187BC) and Eucratides I (171BC)gives two eras Indo-Greek and Graeco-Bactrian Eras. There is a great Secluid era(Anchor of all western Eras), which also has number of Guesses in it. There is another Bactrian Era starting at 157BC. There is Araces Era. Now which era is Vijayamitra is referring to. If we take the Indo-Greek era as the Greek Era, it gives 171-128 =43BC as the start of Azes Era. This Azes Era 43BC date does not match 57BC of Vikrama Era. Most Western Scholars argue that the era came into prominence because of Gupta Emperor Chandragupta Vikramaditya. But Guptas ruled from Pataliputra and Ujjain is the capital of Vikramaditya we are talking about. Some have floated the idea of second capital , but there is absolutely no basis for the second capital. Not single Gupta Inscription is dated to this era, not even found in malwa region. Bhavishya Purana Says at the completion of 3000 years after the advent of the terrible Kaliyuga, a person descended from the abode of Guhyakas in Kailasa, at the command of Siva, for the purpose of destroying the Sakas and uplifting Arya-Dharma. He was born to the Great King Gandharvasena. The father named him ‘Vikramaditya’ and felt very much rejoiced. There is not much evidence to show that there was a Era named after Vonones. The Azez Era eventhough mentioned in the inscriptions, cannot be said to be era like Vikrama era. The date of Start of Azez Era is suspect. So both these era's cannot be equated with Vikrama Era. We have well known tradition of this era being used as Krta , Malwagana and Vikrama era's. Eventhough the name changes over period, the era is fairly accurate. This era as per tradition started 57BC and had origin in the court of Vikramaditya in Ujjain. The Era seems to have used only in Malwa region as Krta era or golden age. Later when rulers of Ujjain went to other parts of India. The era went outside as Malwagana saka, The era of malwa people. Around 8th century the tributes were paid to the great Vikramaditya. The era was then came to be known as vikramaditya Sake. We have literary evidence in the Jain Literature. Inscriptional evidence of vikramaditya and have coins issued to celebrate Malwa people victory over Sakas. Indology scholars have rejected all the Indian evidence and struck to equating the era to some foreign ruler from that time. Vikramaditya established the rule of Malwas by driving out Sakas from Malwas and adjoinging areas. The tradition first started to celebrate this success, later went take name of the leader who made this happen, Sakari Vikramaditya of Ujjain. It came to be known as Vikrama Samvat starting from 57BC. A rough guide to Kushan History - The Azes Era by Roberto Bracy. We have consistently seen Saka era along with Vikrama Samvat are two era used in India for the last two thousand years. We have seen Pulakesin gives shalivahana saka starting at 78 AD. Vikram Samvat starts at 56BC. In Indian Literature these dates are counted from start of Kaliyuga that is 3102 BC. in Kaliyuga counting Saka era starts at 3180 and Vikram samvat starts at 3046. These dates are well established by Indian and Foreign experts. So what is the problem. Let us see. Varahamihira quotes Vraddha Ganga "According to Vrddha Ganga, the Sages (Saptarsis) resided in the Magha nakshatra, when king Yudisthira ruled the earth, and the year of the reign can be obtained by adding 2526 years to the number of saka years elapsed". Now we have Vraddha Garga , who is an impeccable astrologer and Varahamihira even more versatile one, why will they give the dates wrong. When we see this saka era it starts at 576 BC. We know Shalivahana Sake Starts at 78AD. Vahara Mihira was Astronomer , Mathematician and Astrologer who lived in Ujjain, he was born in Avanti region (Malwa) to Astronomer Adityadasa. He was educated at Kapitthaka. He is considered as one of the Nine Jewels of Vikramaditya of Ujjian. His son Prithuyasas was also Astrologer, his work Hora Sara. His main Work is Panchasiddhantika (treatise of Five cannons(Astronomical)). He gives info on older Indian Astronomical works now lost namely Surya Siddhanta, Romaka Siddhanta, Paulisa Siddhanta, Vasishtha Siddhanta and Paitamaha Siddhanta. It is a monumental Work. Another major work is encyclopeidic Brihat Samihta. It covers wide ranging subjects of Human interest, including astrology, planetary movements, eclipses, rainfal, clouds, architecture, growth of crops, manufacture of perfume, matrimony, domestic relations, gems, pearls, rituals etc. Varahamihira says 427 must be subtracted from saka era for his era. So 427 saka was the start of his era or birth of varahamihira. Amara raja gives the date of 509 Saka for varahamihira death. Indologists comes with 427 + 78 = 505AD as the birth of varahamihira. So the problem is solved. But why does the dates don't reconcile. The Astronomical Positions mentioned in his works don't match for celestial positions of 6th century AD. Shalivahana Saka is famous in South and West of India and Ujjain or Malwa especially followed Vikrama Samvat. Now why does one refer to Shalivahana Saka, which is from rival powerhouse. If Aryabhatta was in 5th century AD, Varahamihira was in 6th century AD. Pulakesin Edict is 7th century AD. While Aryabhatta and Pulakesin Edict gives 3102BC and Varahamihira 2448bc. Working from 576BC as start of Saka era gives varahamihira date as 149 - 67 BC , which places Varhamihira in Vikramaditya court as one of the nine jewels. Jyotividabharana, a treatise on Astrology says it was completed on month of kartika of the year 3068 of kali (34BC). It says that the framing rule for finding ayanamsa is 445 years after saka and remainder divided by 60. If we go by Al beruni statement, Gupta reign ended 241 years after Saka era, If we take 78AD, than it comes to 319AD. There is no scope for Vikramaditya of Ujjain reigning in 6th century AD for Varahamihira to become his navaratna. Alberuni says that Year 400 years before Vikramaditya or 457 BC was in use before Vikaramaditya. He calls it as Sree Harsha Era. This era was available in 11 century AD. Kota Venkatachalam says, based on the authority of Bhavishya purana, that this Vikramaditya is a son of Gandharvasena , a King of Ujjain. His son Deva Bhaktha reigned after him. 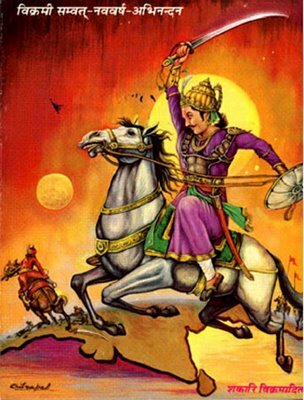 T S Naryana Sastri says that Sri Harsha Vikramaditya of Kashmir defeated the sakas and in commoration of his victory founded the Harsha era, in the year 457BC. In his work Haidimba Vaidagdhya, he identifies Matrgupta of the court of king Harsa Vikramaditya of ujjain as Kalidasa I living in 6th century BC and Medharudra on the court of of vikramaditya of Malwa as Kalidasa II in first century BC. Sakas came to prominence on the periphery of India around 800 BC. They Came into prominence in India after the collapse of Satavahanas dynasty in Magada (802BC). They were in prominence for 380 years (802 - 422 BC). They were in considerable power struggle with local Indian rulers. In 551BC Darius has collected all the scattered Saka and invaded India. Which confirms 576 BC to be date when Sakas were soundly thrashed and scattered by Sree harsha. This may start Saka era in this case old saka era. Saka of Kalhana and Varahamihira are same. Kalhana also talks about Sree Harsha Vikramaditya of ujjain. Varahamihira was one of the nine jewels of Vikramaditya court. Varahamihira was born in 427 Saka. He died in 509 Saka. Shalivahana saka does not fit to this dates. As there is no vikramaditya in Ujjain during at that time(6th century AD). There were no sakas also at that time. Hunas were already vanishing. So there is no probability of Vikramaditya in 6th century AD at Ujjain. Date of old saka era is 3102-2526 = 576BC. Some people take the start 2526 from Start of Yuddhistra era and arrive around 612BC. Here 576 is calculated from end of Yuddhistra reign, which ended soon after Kali yuga started. When Varhamihira talks about saka kala, Saka Bhupakala, Sakendra kala, Saka Nrpati Kala, it refers to rule of saka rulers in India not shalivahana saka. All these points when we consider does indicate there was old or original saka era started by Sree Harsha in Sixth century BC. Varahamihira, Vraddha Garga and few others quote this saka era. Even alberuni seems to mention this saka era. Later on he seems to have confused himself with Harshavardhan of Kannuj. This varahamihira was in the court of vikramaditya of Ujjain in first century BC. Date of start of Old saka era is 576BC. Soundaryalahari stanza is given below. It contains world Dravida sisu. Now who is sankara referring to as dravida Sissu is the debate. Is it Sankara or Sambandhar. Let us see. Now the question is who is this dravida Sisu, There is various theories on who this is. Let us see them. This is the legendary story of about Sankara when he was a kid. Sankara's father Sivaguru worshipped Manikyamangalam Sri Katyayani Devi, who was his Ishta Devata. Sivaguru offered milk as naivedyam to this Devi and brought home a small quantity of this milk as prasadam every day. Sivaguru used to give this prasadam to the child Sankara which he thought that it was the remnant left over by the Deity. Once, Sivaguru had to proceed to a distant place. Hence, Aryamba, Sankara’s mother took care of the poojas on his behalf. Sankara, a child of four years also assisted her during the poojas. One day, Aryamba directed Sankara to do the poojas , since she was not well. Sankara went to the temple and placed the pail of milk before the Godddess and prayed her to drink the milk. After some time, seeing that the Goddess did not consume the milk, the child started to weep loudly on disappointment. The Devi was surprised and asked him the reason. Sankara asked Her to give him his share! With a smile Devi placed him on her lap and fed him with the milk from Her breast. It is said that because this divine blessing, Sankara became a celebrated poet. Sambandar was born to Sivapada Hrudiyar and his wife Bhagavathiar who lived in Sirkazhi in what is now Tamil Nadu. They were Saivite brahmins. When Sambandar was three years old his parents took him to the Shiva temple where Shiva and his consort Parvati appeared before the child. His father saw drops of milk on the child's mouth and asked who had fed him, whereupon the boy pointed to the sky and responded with the song Todudaya Seviyan, the first verse of the Tevaram. His father impressed named in Ganan Sambandhar. He later was called Thiru Gnana Sambandhar. Now the debate is Dravida Sissu mentioned by Sankara Soundharya Lahiri is Sambandhar according to Dravidian Scholars. Let us see. Most scholars think it refers to himself. The story suggest same. Appar Contemproary of Sambandhar used Jaya Jaya Sankara in his thevarm poem. Now we all know he is referring to Shiva. But we can also say he is referring to Adi sankara. Such word play cannot form basis for historical debate. Adi Sankara combined 72 sects to establish six streams of Hindu Diety Worship. Vishnu, Shiva, Devi(Shakti), Surya , Ganesh, Shanmuga (Skanda). Now this concept is called Shanmatha. Sambandhar refers to shanmatha in his padigam. Sankara ParamaGuru (Guru of Guru Govindapadacharya) Gaudapadacharya is knows as Dravidacharya in North. Shankara praises him as the ultimate authority of his philosophies. Dravida can be a reference to him. Now we already seen in another article on Date of Devaram Trio, date of Sambandhar is atleast 1200 AD or later. Dravidian Scholars claim the date to be 7th century AD. Official accepted date is 8th century AD. But there are many claims such as 5th Century BC etc. There are some temples dedicated to thevaram trio and some have a statue of a child. Usually statue of child eating butter is Krishna. But due to Sambandhar legend, there are Sambandhar statues as well. Dravidian scholars are of the view that all the child statues are sambandhar. Now when do these statues start apprearing, After 1100AD.